If you believe that you or a family member may have been a victim of medical malpractice resulting in serious injury, you should consult a Board Certified medical malpractice attorney. ABPLA Board Certified medical malpractice attorneys are among the best medical malpractice attorneys in the country. Each Board Certified attorney must meet and exceed rigorous standards through Experience, Ethics, Education, Examination and Excellence in professional liability law. Legal malpractice occurs when a lawyer commits an error, omission or breach of duty to the client or the justice system that results in a negative legal outcome or monetary loss for the client or a third party. There was a violation of the standard of professional conduct - The law acknowledges that there are certain legal standards that are recognized by the profession as being acceptable conduct. These standards of professional conduct are largely determined by the ethics rules of the state bar association. Attorneys have an obligation to their clients and the bar to operate within these standards. Clients have the right to expect attorneys will follow the law, behave in an ethical and honest manner, act in the best interests of their clients with integrity, diligence and good faith, and will execute their matters at a level of competency that protects their legal rights. Lawyers must also maintain and supply clients with full and detailed reports of all money and/or property handled for them. Finally, attorneys must not inflict damage on third parties through frivolous litigation or malicious prosecution. If it is determined that the standards of professional conduct have been violated, then negligence may be established. The negligence caused a negative legal outcome - It is not sufficient that an attorney simply was negligent for a legal malpractice claim to be valid. The plaintiff must also prove that there were legal, monetary or other negative ramifications that were caused by the negligence. An unfavorable outcome by itself is not malpractice. There must be a direct causative link between a violation of the standard of professional conduct and the negative result. The negligence resulted in significant damages - Legal malpractice lawsuits are expensive to litigate. For a case to be viable, the plaintiff must show significant damages that resulted from the negligence. If the damages are small, the cost of pursuing the case might be greater than the eventual recovery. To be worth pursuing, the plaintiff must show that the outcome resulted in losses far in excess of the amount of legal fees and expenses necessary to bring the action. 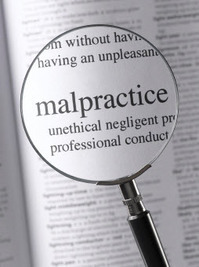 If you believe that you or a family member may have been a victim of attorney malpractice, you should consult a Board Certified legal malpractice attorney. ABPLA Board Certified legal negligence attorneys are among the best legal malpractice lawyers in the country. Each Board Certified attorney must meet and exceed rigorous standards through Experience, Ethics, Education, Examination and Excellence in professional liability law.